The talent of hairstylist Katsuya Kamo is such that he almost instantly grasps the essence of the designers and photographers he works with. His ability to understand what is asked of him — usually in a matter of minutes during the hectic preparations for a show — and his artistic sensibility were on full display in the exhibition “100 Headpieces,” held at the Laforet Museum in Tokyo in October. Visitors were able to experience these creative highlights, which completely filled the exhibition space and were remarkable both in terms of their sheer number and the tension they possessed. Kamo works for top brands, including Chanel, Fendi, Junya Watanabe, and Undercover, and his headpieces always correspond to the aesthetics of each particular designer combining such diverse elements as bird feathers, paper, studs, and leather. KAZUMI ASAMURA HAYASHI — When did you become a hairstylist? KATSUYA KAMO — In the late ’80s. When I was in high school, living in rural Fukuoka, I thought that I wanted to work in illustration. But my parents told me to become a sign maker instead. I hated that idea! Rei Kawakubo and Yohji Yamamoto were showing in Paris, so I thought about becoming a clothing designer. But I couldn’t decide on a direction, and I didn’t even know that professional arts colleges existed. But we did have hairdressers in rural areas, so I thought I could do that. That’s sort of how I got here. KAZUMI ASAMURA HAYASHI — How do you collaborate with a designer on a collection? KATSUYA KAMO — I really don’t think about it too deeply. I just start with something I think is good. Initially, I don’t receive materials from the designer. I only get a key word, and then I work on the pieces on my own. The essential elements in the Junya Watanabe show came together because of his unmatched ability to integrate. He really has great talent, and his sense of balance is strong. I think he has an amazing ability to choose and then incorporate the venue, music, models, and so forth. KAZUMI ASAMURA HAYASHI — The headpieces in the Junya Watanabe show are creations that really go beyond the usual realm of a hairstylist working with hair. For the Spring/Summer 2014 season, you also have pieces that are actually combined with the clothing. When did you start working with Junya Watanabe? 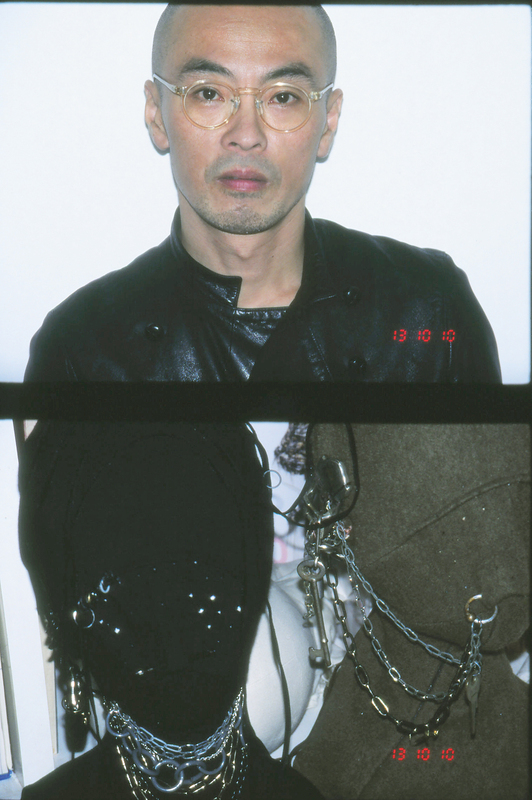 KATSUYA KAMO — In 1995. At the time I was just starting to use headpieces in hairstyling. Our working relationship is pretty unique, since we don’t really have meetings together. Before we developed a one-on-one relationship, we spent about seven or eight years never talking. I had met him about 20 times, but had probably only spent a total of 10 minutes actually talking with him. Even when we did have meetings, he would come and look and then immediately leave. It was like, “What? No opinion, not even a word?” But I think he’s like that precisely because we have developed a relationship of trust. 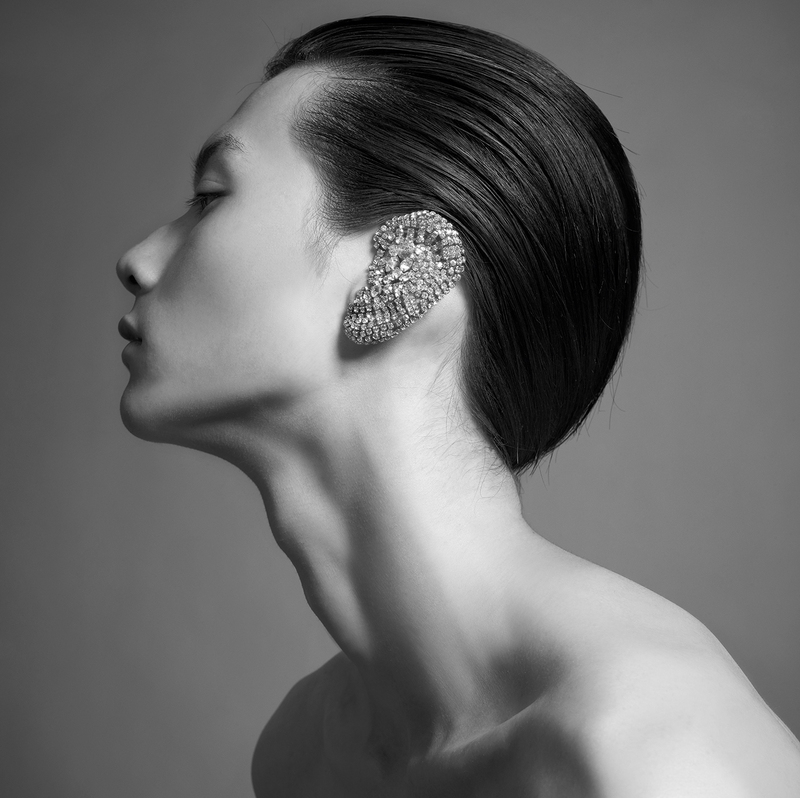 KAZUMI ASAMURA HAYASHI — Which designers do you like to collaborate with? 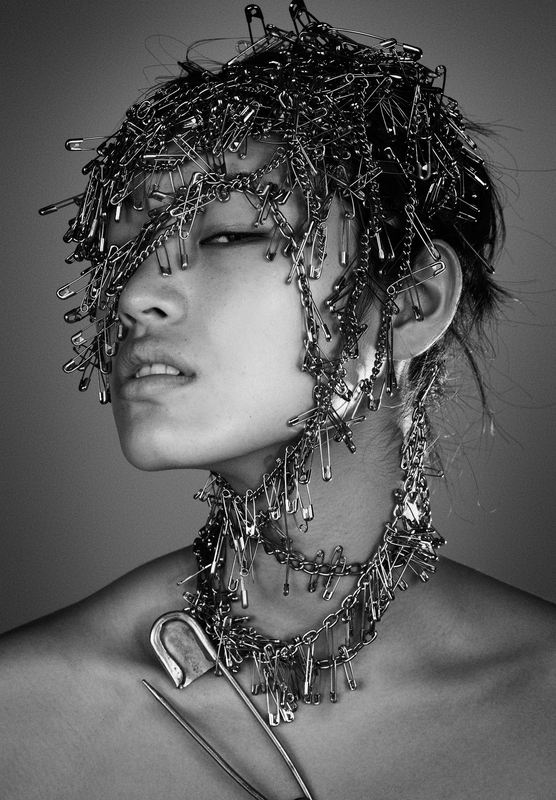 KATSUYA KAMO — I like to collaborate with designers who work with intuition and instinct. I see that in Karl Lagerfeld, but also in Rei Kawakubo and Junya Watanabe as well. For example, if Karl Lagerfeld looks at something and says it’s okay, it’s okay. I don’t get complex orders from him, and I get the impression that he’s the kind of person who works with intuition. It’s important to be confident enough to make decisions based only on what’s good or bad for oneself — I think that’s how I’d like to be as well. KAZUMI ASAMURA HAYASHI — Where do you get this self-confidence you have in your work? KATSUYA KAMO — I was watching a video of production scenes made by Yayoi Kusama, and there’s a strong message in there about only doing what you think is good. Pursuing the best thing is important, because when you think about too many things, they gradually get more complicated until you can’t get to the core of anything. These people — they understand that you can only make judgments based on your own personal criteria. I felt the same thing when I saw an image drawn by Keith Haring; it was about five-meters square, and apparently he had completed it in less than 20 minutes. 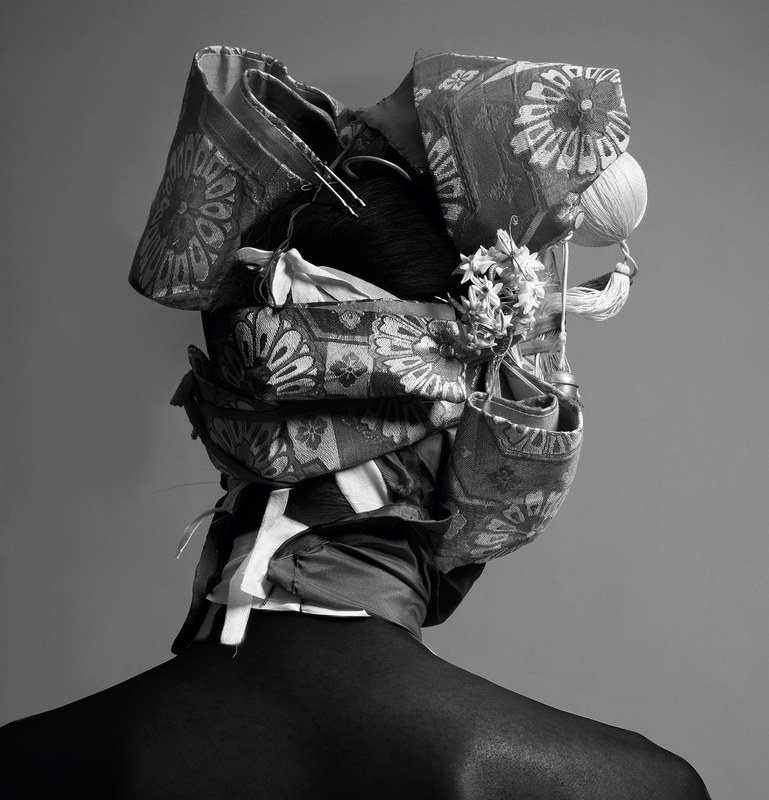 KAZUMI ASAMURA HAYASHI — Tell me about the circumstances that led to the recent “100 Headpieces” exhibition at the Laforet Museum. KATSUYA KAMO — Well, I’ve had a somewhat vague desire to do an exhibition for a long time. And then the art director, Rikako Nakashima, invited me to the venue. But I think they were initially kind of skeptical as well, like, “a hair guy doing a show?” The show doesn’t include all my past work, but it shows a lot of it.